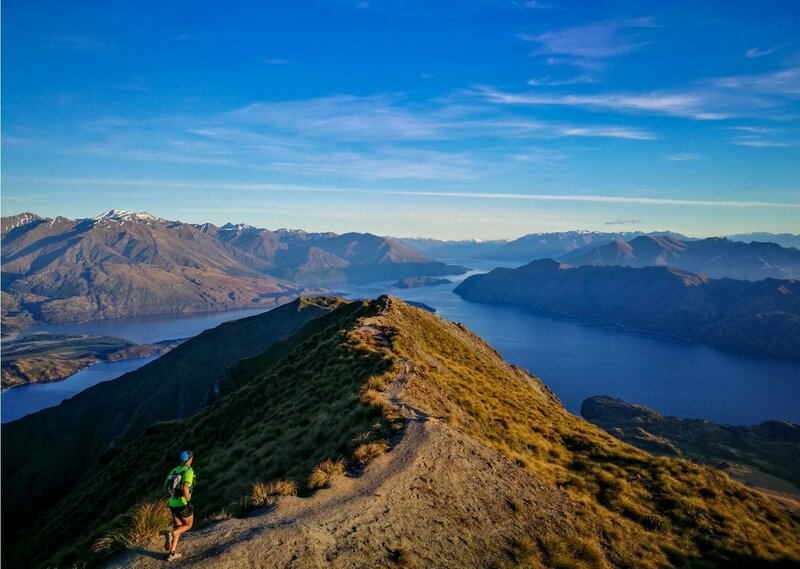 The Classic trail running tour takes in the best of what Queenstown, Wanaka and the surrounding area has to offer. The Classic combines one full day mountain run plus two half day runs, and a couple of optional extras. We explore the Oteake Conservation Park, wrestle with Roys Peak and battle with Ben Lomond in Queenstown. Those eager enough also have the chance at some optional extras, including a recovery run or ride on some of the scenic Central Otago Rail Trail, a sunset run up Queenstown Hill, plenty of exploration to soak it all in and self selected recreation time that could include anything from luge rides to downhill mountain biking. We will cover approximately 60-70km over the tour and around 3000m+ of elevation, all sandwiched between arrival and departure days either side. Difficulty The terrain and distances are sure to challenge, so you do need to take note of distances, terrain types and your fitness levels. However, our style remains holiday-esque, so don’t bring your game face except when facing the mountain itself. RunAways are holidays tours. We encourage anyone with the stamina to join our tours. While our tours may be physically very demanding, speed is irrelevant and we are non-competitive. This isn’t a training camp, it’s a holiday, just like no other! If you have any questions about your fitness, please get in touch. Day 1 | Arrival: Start with our first meet up at Queenstown Airport. Meet team and tour briefing. Day 2 | Oteake Conservation Park: A big day to start the tour, with around 30km-35km to shake of any laggy travel legs. Day 3 | Recovery: Optional recovery run or ride on parts of the Central Otago Rail Trail and time to soak in some of the sights of stunning Wanaka. Day 4 | Roys Peak: Tackle this standout classic after an early start. The goal is a sunrise summit, and a delicious post run meal of course! Day 5 | Travel & Queenstown Hill Hike: Today we travel, with an option later in the day for a hike up Queenstown Hill to keep those legs moving. Queenstown is our final destination and tonight we prep for our final push tomorrow morning. Day 7 | Tour End. Group bus available for drop offs at Queenstown Airport or for those staying on in Queenstown, their nearby accommodation. Travel within New Zealand with the RunAways group. Some breakfast/meal options (Bread, spreads, cereals, milk, coffee and tea) and snacks (some fruit, muesli bars). Two spirited, experienced & passionate runners as guides. Costs of any optional recreation activities, including any hire of equipment, entry fees or contracting third parties for services. Food and meals outside of the provisions mentioned in Inclusions. Individual optional travel outside of group activities and local area transfers. Please note: We have done our utmost to ensure all material published on this web page is accurate and up to date. However, any and all actual tour details can be updated from time to time. Final confirmation of any details must be made direct with the organisors and are reflected in the Administration Pack.